January 2, 2014 By Denny Hansen & filed under All Articles, Handguns, Weapons. Right side of Kahr PM45. When the topic of conversation turns to very compact handguns, the caliber most often mentioned is the .380 ACP, followed by the 9mm Parabellum and the .38 Special. Larger calibers need not apply. While there are some very good handguns made in the .36-caliber range, I suppose I’m somewhat of a Luddite in that I prefer large calibers. I agree with Elmer Keith, who said, “Big bullets let in a lot of air and let out a lot of blood.” Besides that, a shot to the central nervous system is what incapacitates bad guys quickly. I realize that the most important component is shot placement and “small” rounds will work. But when you’re moving, the bad guy is moving, and the background is in a constant state of flux, getting a hit on any piece of the target may involve as much luck as skill. The choice is either going with a smaller handgun in an equally smaller caliber or going big, right? 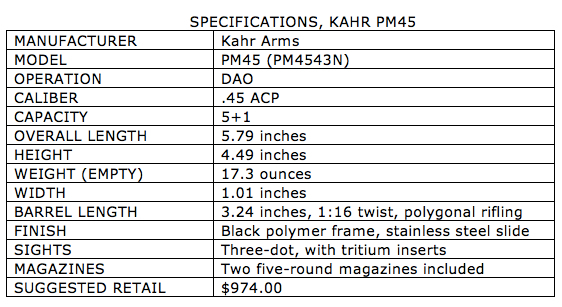 I recently requested and received a Kahr PM45 for test and evaluation. Although smaller than many other compact pistols, it is chambered for .45 ACP, as its name implies. The PM45 is available in four versions: blue steel slide, stainless slide, and with or without night sights in either finish. 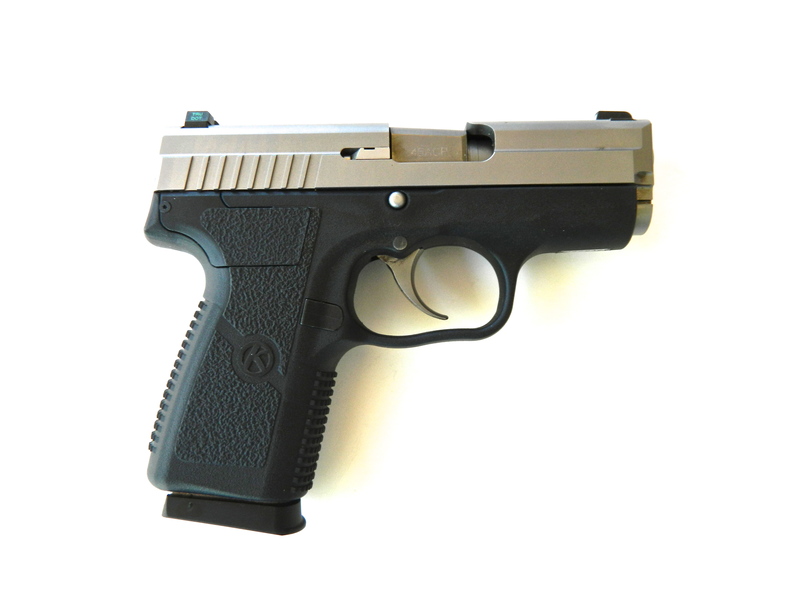 The test pistol had the stainless slide with night sights (SKU PM4543N). The slide has been dehorned, with the only sharp edge on the top leading edge of the ejection port. The front of the slide has been beveled on both sides. The serrations at the rear of the slide are sharp enough to ensure positive grasping, but not so sharp as to abrade skin or clothing. Sights are of the three-dot type. 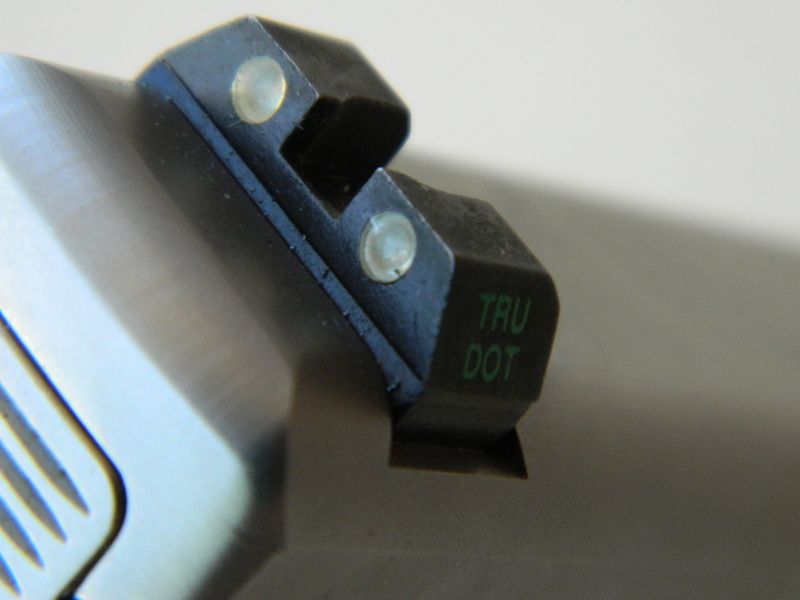 Both front and rear sights are mounted in dovetails and are drift adjustable. The frame—regardless of model—is manufactured from a black polymer. There are stainless steel inserts that the slide runs on at the back of the frame and on either side of the dustcover. Very aggressive checkering is molded into the frontstrap and arched backstrap. 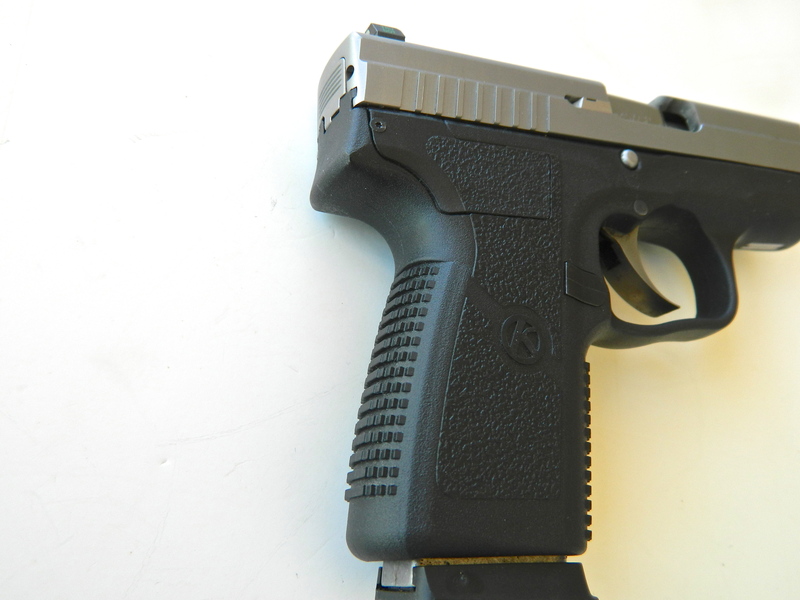 Slide lock and magazine release can be manipulated without losing firing grip. 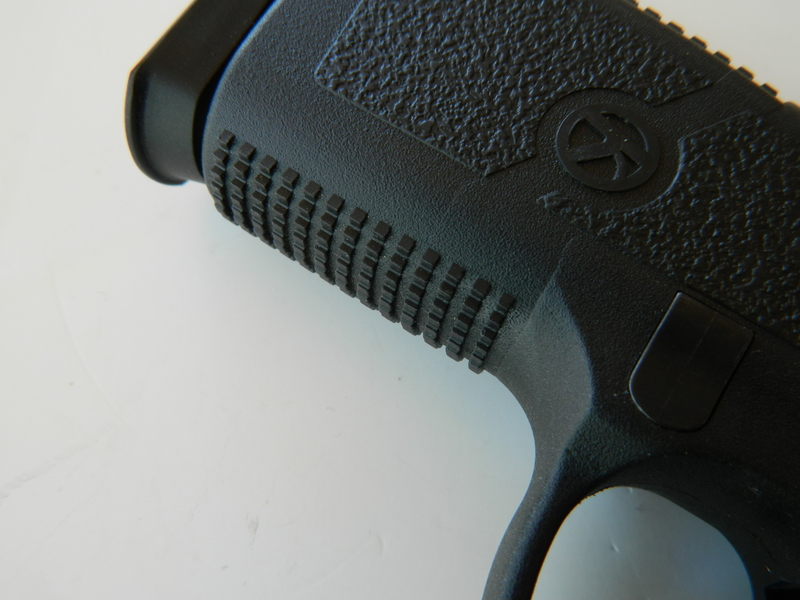 The frame is designed so the slide is as close to the hand as possible, which helps reduce felt recoil. In my average-sized hand, both the magazine release and slide lock could be manipulated without changing my grip on the pistol. The only safety on the PM45 is a passive striker block. 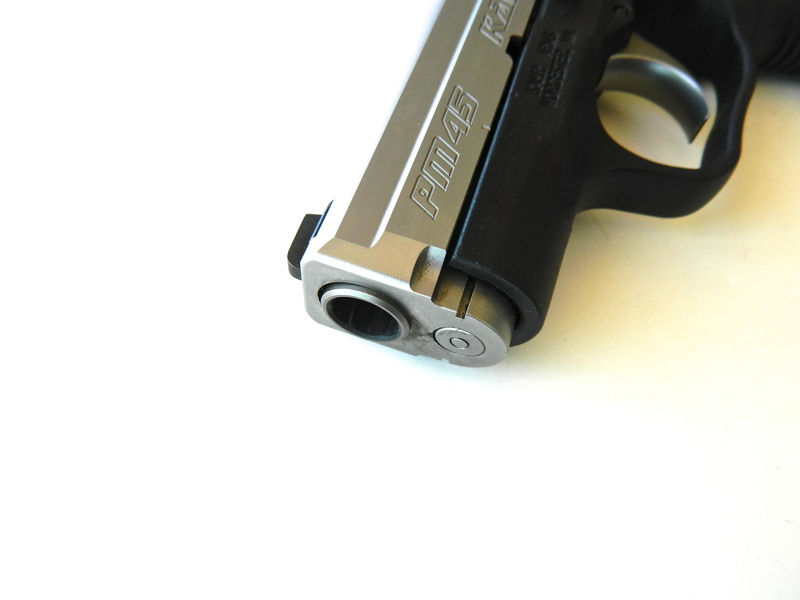 Although Kahr states that the extractor on all their pistols—except the P380—protrudes and can be used as a loaded chamber indicator, the extractor protrusion on the PM45 is so minimal that using it for a chamber indicator is useless. I don’t have a problem with that and would prefer to perform a manual loaded chamber check anyway. The PM45 comes in a fitted hard case and includes two magazines, a trigger lock, and manual. Front of slide is beveled. Entire pistol is dehorned. If there is a downside to the PM45 at first glance, to many it would be the “low” capacity. Total rounds in the pistol are five in the magazine plus one chambered. Consider, however, that the PM45 is roughly the same size as a “J” frame revolver, which many citizens rely on as a handgun they can carry easily in the front pocket of a pair of trousers. 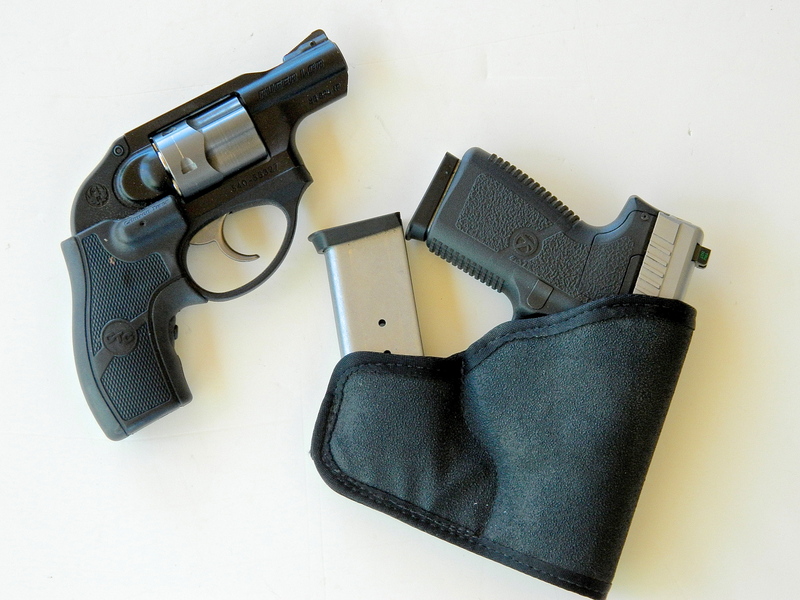 In fact, the PM45 fits the same Tuff Products Pocket-Roo holster that usually carries my Ruger LCR. Add the fact that the PM45 packs six rounds instead of five, is chambered for .45 ACP instead of .38 Special, and is faster to reload, and the “capacity problem” is truly not much of an issue. With no external safeties to cause confusion under stress, the PM45 would also serve well as a back-up gun either for peace officers or private citizens. The pistol does not have a magazine safety. Front and rear backstraps have very aggressive molded-in checkering. The PM45 disassembles quickly and easily for cleaning. After removing the magazine and ensuring the chamber is empty, pull back slightly on the slide until the mark on the slide lines up with the corresponding mark on the frame. 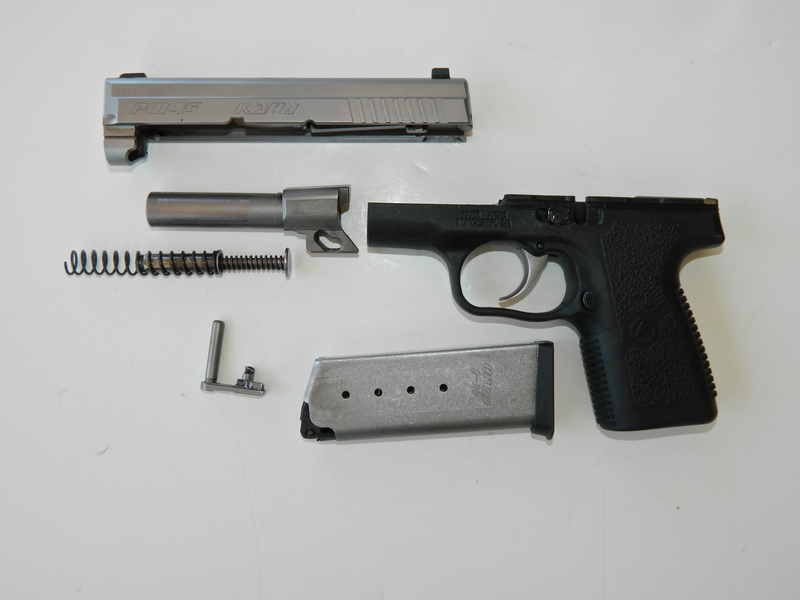 Push out the slide lock from right to left, depress and hold the trigger, and push the slide off the frame. Now push the recoil spring and guide forward and off the barrel lug. Push the barrel slightly forward and remove it from the bottom of the slide. Reassemble in reverse order. While I had the PM45 disassembled, I noticed two things worth mentioning. The first is the recoil spring. The bane of compact—and particularly subcompact—.45 pistols is the recoil spring. Due to how fast the slide runs on these small guns, a single spring can often lose enough power to make them have malfunctions in as few as 500 to 600 rounds. One way to solve this is to replace the spring on a regular basis, especially if the pistol is carried for defense. A better way is to use a dual recoil spring such as the one utilized by the PM45, as they are much more durable. The other item worth mentioning is that the ramp on the barrel has a mirror finish. This helps function not only the initial feeding because it is smoother, but a smooth finish will not accumulate fouling as much as a rougher finish. Frame is designed to position the hand high and close to the slide. I took 23 different loads to the range to chronograph and perform initial accuracy testing. They consisted of 21 factory loads from seven different manufacturers, and two handloads. 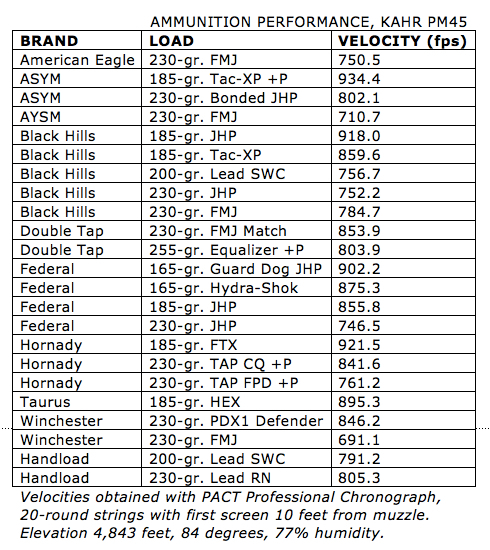 I performed 20-round strings with each load to establish the average velocity (see table). In front of the chronograph, I placed a target ten yards downrange so I could combine the accuracy testing. Firing the PM45 slowly and deliberately over the chronograph screens, the pistol turned in three groups. 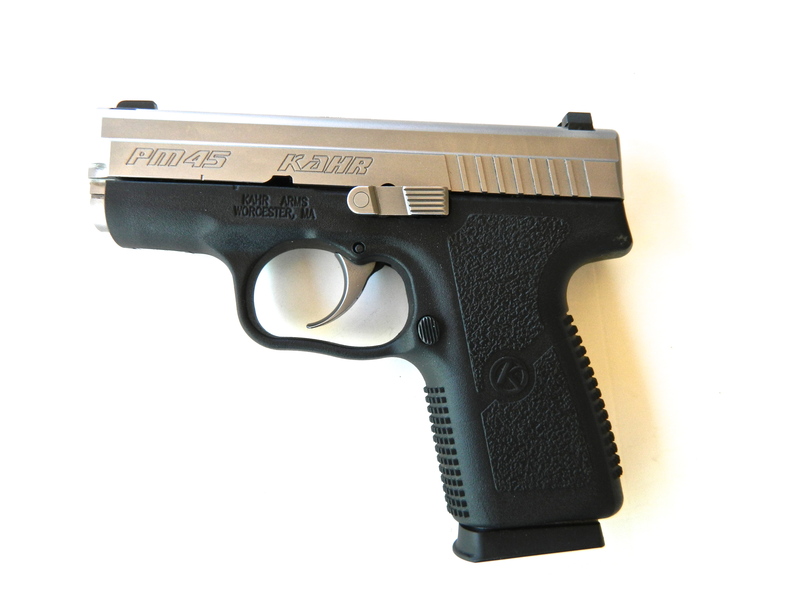 The Kahr PM45 has a very workable trigger, especially for a striker-fired pistol. About halfway through the initial testing, I had several fail to eject malfunctions and several ejected cases hit me in the face. These were not the fault of the PM45. Apparently I’ve been spoiled by all-steel guns, so I became a little too comfortable with the PM45 and was limp-wristing it enough to cause the malfunctions and straight-back ejections. Sights are of the three-dot type. Night sights are an option. After concentrating on correcting the operator error, I had no further malfunctions, with the pistol gobbling up everything I fed it, from Double Tap 255-grain Equalizer +P to my 200-grain lead semiwadcutter handloads. The PM45’s manual states that the pistol should not be considered reliable until it has fired 200 rounds. I agree that any defensive firearm should prove itself before being relied upon, but the PM45 ran well from the very beginning. I fired the initial 460 rounds in about two and a half hours, and the palm and web of my right hand were beginning to ache after firing this amount of ammo—some of it +P loads—in such a short time. It was similar to shooting .38 +P out of a snubnose revolver—doable but not exactly pleasant. I went out the next day and put another 300 rounds through the PM45, but this time ran multiple target, barricade, and shooting and moving drills. Out to about 15 yards the Kahr, in my hands, was capable of five-inch groups. At 25 yards, the pistol kept all shots within an eight-inch circle. I honestly did not expect much more from a 3.24-inch barrel and the short 4 3/4–inch sight radius. With a firm grip, I also fired it one-handed with no problems. But a loose grip (limp wrist) caused a few failure-to-eject malfunctions. PM45 does not have a larger footprint than a .38 Snubby, has a higher capacity, and fires the .45 ACP. Overall I was pleased with the performance of the PM45. At the distances it will likely be employed, it is more than accurate enough to accomplish the task at hand, and if needed can hit reliably out to 25 yards. If I were to buy it—and I just might—I would probably knock off some of the high spots on the front and backstraps. Reliable, large caliber and doesn’t make a larger footprint than the five-shot Snubby…I couldn’t find anything I didn’t like about the PM45 for a concealed-carry pistol. 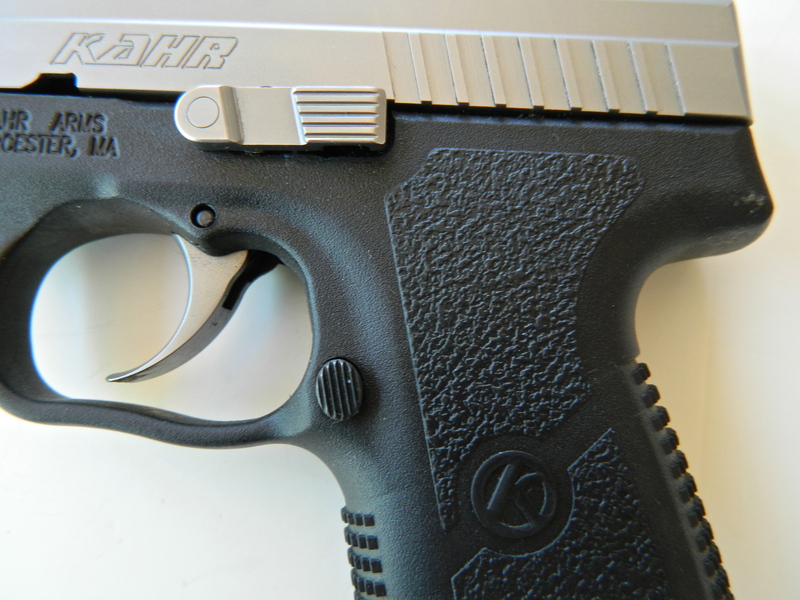 If you want a compact pistol that fires a .45, check out the Kahr PM45.